How did you end up in Afghanistan in the first place? The simple answer is that Afghanistan is repeatedly ranked the worst place in the world to be a woman. When I decided that I needed to fight for women’s rights and against gender violence, I looked at Afghanistan as a starting point. I was also really curious about the country as a whole. The history there is incredible. I wanted to understand systematic oppression and how an entire country comes to oppress women. That lead to the work I wanted to do there and also the work I wanted to do back in the US against gender violence. Shannon Galpin with Afghani girls. Photo by Deni Bechard. What were you doing before you started working in Afghanistan? Ironically I was a sports trainer. I’d worked in the Middle East and Europe and had recently moved back to the States. It was a complete 180 degree turn from sports trainer to activist and humanitarian. 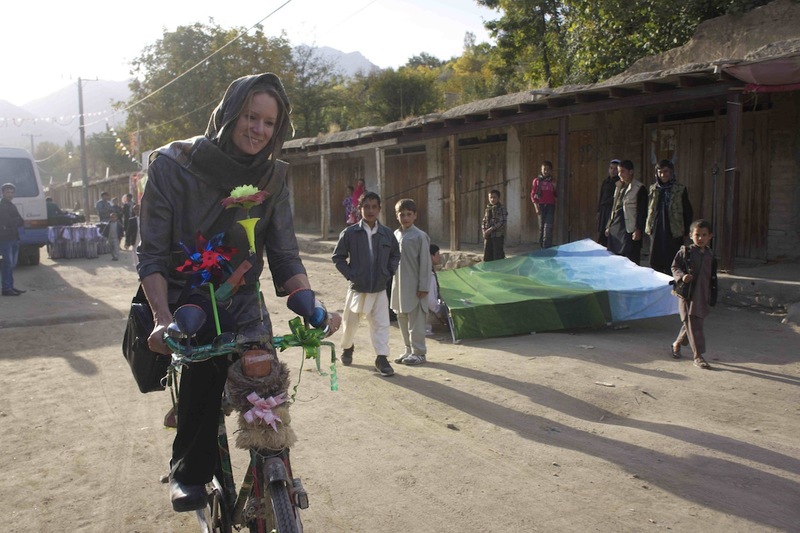 What compelled you to buck the cultural norms and start riding your bike in Afghanistan? I’d made three different visits at that point. I had been looking at situations for women in rural and urban areas. There’s such diversity of women who are activists and politicians in urban areas and women who live in rural areas. But the one constant was women can’t bike. There was a women’s boxing team, Tae Kwan Do, girls are playing cricket, there’s a girls soccer team. But I never saw girls riding no matter where I was, despite bikes being everywhere. Boys and men ride them everywhere as transportation. I also realized after the first three or four visits that as a foreign woman I was considered an honorary man. That meant that I was considered equal to men. I was allowed to get away with a lot more than perhaps an Afghan woman would. You’re essentially this neutral gender. As a mountain biker, there were several things that nudged me to ride. For one, the country is just incredibly beautiful and I wanted to explore it on two wheels. Also I could raise these questions around why girls can’t ride bikes if I am riding a bike. I’d hoped curiosity would start these conversations and that’s exactly what happened and why I continued to ride. Every place that I ever rode a bike–and I rode my bike over a dozen or more trips in different areas of the country–the bike became this incredible ice breaker. It allowed me to have very organic conversations on the side of the road or off a goat path with Afghan men about the work I was doing, about sports, about whether or not women can ride in their community and why. Tell me about your nonprofit Mountain2Mountain. The mission of Mountain2Mountain is to empower women and girls in conflict zones. I started it right before I first went to Afghanistan in 2008. The initial projects were, I don’t know if the right word is mainstream, but certainly more familiar. I helped facilitate building a school for the deaf. We worked in women’s prisons, I started a computer lab at a girls school and supported a boys school. I started to realize I could best do the work I was doing if I connected it to my passions as both an artist and an athlete. I was fascinated by the artists, athlete, and activists in Afghanistan. The women in those worlds typically are more engaged. They’re pushing boundaries. They have a voice. I wanted to look for ways I could encourage that and support them and also share those stories back home. I started supporting graffiti projects by local Afghan artists. We created a life size street art exhibition with a group of photographers called Streets of Afghanistan. We set up pop-up street art installations in rural villages around Afghanistan. Then in the fall of 2012, I finally found women who were riding bikes as part of the Afghan National Cycling Team. Ever since then, the majority of my work has been supporting these girls, the coach, the burgeoning cycling federation and hoping that we can normalize biking for girls through the sport of cycling. Shannon Galpin riding in Afghanistan. Photo by Tony Di Zinno. The bicycle literally is a symbol of freedom and a vehicle for independent mobility. In a country that is repeatedly ranked the worst place in the world to be a woman, there is very little freedom for women. When you look back at the US women’s suffrage moment in the early 1900s, the bike was integrally tied in as a symbol of freedom and mobility. Bikes are incredible for getting boys and girls to a school that’s too far to walk to, increasing access to medical care. If we could normalize bikes we could get midwives on bikes, which gives them greater capacity to serve their communities. I’ve seen in a lot of rural communities in places such as Cambodia and India, giving bikes to young women gives them a means to independent travel, which radically reduces instances of gender violence. The bike is just an incredible tool to empower women. In a country like Afghanistan where there are so few freedoms, the bike could radically turn things around. How did people react when you did your 2010 fundraiser ride across the Panjshir Valley? That ride was like all the other rides. The only difference was that I was trying to get from point A to point B over a much larger distance. I knew some locals in the area and it was relatively safe. Everywhere I’ve biked in Afghanistan, I’ve been met with curiosity. Almost to the extent of locals being flabbergasted. Men don’t know what to say, but they’re so intrigued that they just gravitate over and watch and ask questions. It becomes an incredible ice breaker for conversations. It has never been, that I know of based on reactions and conversations, viewed as offensive. The reaction the Afghan girls get is radically different. And that is a very important part of this. I can get away with some of these things and get curiosity and laughter and the men and boys ride my bike, Afghan soldiers ride my bike. It breaks a lot of those cultural barriers. But when the Afghan women ride bikes they have rocks thrown at them, they’re insulted, their honor is questioned. It’s a much more serious situation. I have a unique view to what they have to go through when I train and ride with the Afghan girls. How did you get involved with the Afghan National Women’s Team? It started with just getting them bikes, helmets, equipment. They had rusted out wheels, heavy bikes that were much too big for them. The brakes didn’t work on some, the derailleurs were rusted. Typical situation. We were able to work with Liv to get them racing bikes, training bikes, helmets, spare tubes, tires; everything to kit out the team so they could train and race. They were being invited to regional races in India, Pakistan, the Asian Cycling Championships in Astana, Kazakhstan. We wanted them to have the equipment they needed. It was a great icebreaker first step to do a gear drive and get the equipment over. Then I started training with the girls. Over the past five visits since I’ve met them, we’ve trained together. It’s been interesting because I’m not a roadie, I’m a mountain biker. But my background as a sports trainer kind of came around full circle. We talk about not just riding, but if you’re going to race how to ride in a peloton. How to be comfortable riding close. The normal, basic skill sets that you would need as an amateur team. That’s evolved into supporting them at international races. We’re looking at bringing them to Europe next year to do a training camp. We’re just stepping in as much as we can to support them as they build steam. But also it’s about supporting other girls in Afghanistan who want to ride and getting them basic Pakistani-built steel bikes that don’t look like anything special that they can have at home and can ride in public. Shannon Galpin training with the Afghanistan Women’s National Team. Photo by Deni Bechard. Did the team self organize? How did it get started? Coach Abdul Sediq founded the team. He was the first and at this point really the only Afghan who rode a bike for adventure, for pleasure. He rode I believe to Indian when he was a young man. He started the men’s team and his daughter wanted to race. He started teaching her how to ride and used that as a launch pad to reach out to other families and say, “look, I’m letting my girl ride. Would you consider letting yours?” The beauty of this team is it’s fully Afghan founded and lead. I come in as a foreigner and I’m there to support them. If they want to take these risks, I support them. If they need things, that’s where we step in. And we’re looking long term to figure out how to support the work they’re doing. At the end of the day, they’re the ones that have to take enormous risks to do such a public sport. That’s the danger with cycling compared to even the boxing team, which is perhaps more controversial. But they can box in a gymnasium. Cycling, especially road cycling, is inherently public. Not only do they have to take the risk of cycling down an Afghan highway with IEDs, roadside bombs, land mines, insane traffic. You’re also women doing something that no women in your country have done before that is controversial, dishonorable. They take enormous risks to do what they love and they feel is their right. Again looking back at the turn of the century and the bike being part of the women’s rights movement, women wore huge petticoats and hats, gloves, boots, blouses buttoned up to the chin–very conservative. When they started riding bikes they were labeled immoral and promiscuous. We’re seeing the same thing, just a century later in Afghanistan. I gather that things are quite different now than when you first started riding in 2009. Has progress been made around women’s rights in Afghanistan, at least when it comes to their ability to participate in cycling? It’s this matter of fact approach. But what they’re doing is incredibly revolutionary by the nature of the taboo they’re breaking. But they look at cycling as a sport. They look at it as a way to be healthy. As a way to travel and visit different countries and meet other women their age. It’s incredible. And it’s great progress. That is an interesting litmus for progress. It seems like they almost take for granted their right to do something like cycling that even half a generation ago would never have been considered as such. Exactly. And the scary thing is, the worry is that security could continue to deteriorate with international forces pulling out this year and there will be a backslide. All the rights that women have gained will be lost if they’re not protected. True, organic, community level change takes a generation, so these women are only half way through that. It’s going to take a generation to really have some of these seeds to take root. And it’ll take another generation for these seeds to normalize. I think that a lot of what we see in the international aide world and humanitarian world are one or two year projects. We want quick fixes. We aren’t willing to put the time and patience in to let things grow organically into a generational shift. You’ve got your nonprofit, a new memoir, you’re working on the Afghan Cycles film. What direction do you want to take your work from here? Are there concrete next steps in the work? There are. The goal is to expand the program we’re doing in Afghanistan with the women’s cycling team into other countries, including the US in urban conflict zones like south side Chicago, LA, Detroit, Native American reservations. Looking at areas where violence and particularly gender violence is a huge issue. The program is called Strength in Numbers and it is based on the idea that one woman, one voice can create massive change, but our strength is in our numbers. We want an army of women on bikes fighting for women’s rights and against gender violence and really looks at individual actions people can take in their communities to make them safer and better. This entry was posted in Advocacy, Cycling Media, Interviews, Mountain Biking and tagged afghan cycles, afghanistan, bicycles and women's suffrage, mountain2mountain, shannon galpin, strength in numbers, women and cycling, womens cycling team in afghanistan. Bookmark the permalink.